In addition to selling high-quality flooring, our company also provides effective and efficient ceramic tile flooring installation services. Our friendly flooring professionals have the knowledge and experience necessary to ensure that your floors are installed right the first time. When you consider our wide selection, affordable prices, and helpful installation services, it’s easy to see why our store is the perfect choice when you need ceramic tile products and services. Do the floors in your home look drab or outdated? Are you ready to replace them with modern ceramic tile flooring? 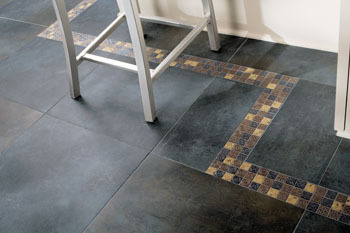 Our customers love our beautiful and extensive selection of ceramic tile floor options. Depend on us for all of your flooring needs—from selection to installation. Whether your interior décor is modern and sleek, or traditional and ornate, our helpful sales associates are sure to help you find a flooring option that fits your aesthetic preferences. Enhancing your kitchen with the addition of ceramic kitchen tiles is one of the best investments you can make for your home. Not only are they perfect for flooring purposes, but they can also be used for counters and walls. We sell these tiles in a wide variety of sizes and colors, including bold, bright, and neutral hues. No matter what kind of visual style you’re going for, we’re bound to have something you’ll love. One use for ceramic tile in your kitchen space is the addition of a backsplash. In addition to their aesthetic appeal, backsplashes serve an important practical purpose by protecting your walls from sauce and oil spatter from your stovetop. Although this may seem like a relatively minor issue, over many years of using your kitchen, it can turn into a big problem. Unlike wallpaper, ceramic tile is extremely easy to clean, which means that wiping away sauces and oils from behind your stovetop will take you no time at all. When having your tile floor installed, it’s extremely important that you work with a qualified professional. Failing to do so could result in an improper floor installation, which means that you’ll have to pay for costly repairs in the future. Ensuring that the job is done right the first time is always the best option. Our friendly and experienced ceramic tile flooring installation crews put their expertise to work for you on every installation job, so you don’t have to worry about the quality of your installation. If you’re interested in taking advantage of our services, please get in touch with us at your earliest convenience. The sooner you give us a call, the sooner we can get to work installing the floor of your dreams. If you’ve been thinking of having a new floor installed, now is the time to act. As soon as your tile floor is properly installed you’ll enjoy immediate value from its beauty and durability. Contact us for all of your ceramic tile needs. We serve customers in Kalamazoo, Portage, Mattawan, Schoolcraft, and Plainwell, Michigan.